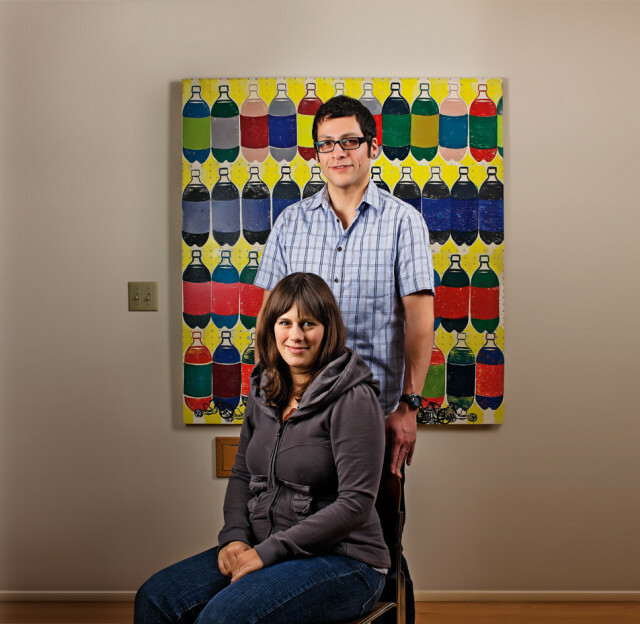 Anna Joyce and Victor Maldonado next to a painting by Maldonado, a Mexican American artist influenced by the street art of San Francisco. Anyone passing by the ocher ranch duplex that painter Victor Maldonado and designer Anna Joyce call home wouldn’t necessarily guess a couple of visual savants dwell there. But once inside, it’s clear from the artful placement of objects and the unabashed use of vibrant color and graphic patterns that both Maldonado and Joyce possess an uninhibited flair for artistic sophistication. A single bright blue wall helps a tiny bedroom pop without jarring the senses. On a dining room shelf, a quirky thrift-store plate decorated with cartoonish blossoms evokes warmth and cheer. 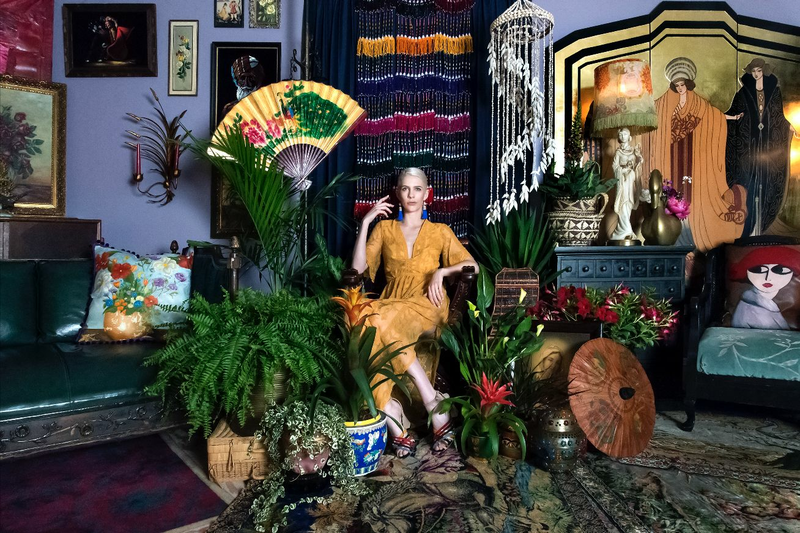 With just about every accent in their Buckman home, Maldonado and Joyce’s goals are to engage the eye and to entertain, talents they honed as students at the California College of Art in Oakland, where they met in 1998. After living in Chicago for three years, they moved into their Southeast Portland rental, which has huge windows, a full basement big enough for each to have an art studio, and lots of wall space—which gives Joyce her own blank canvas of sorts. “I’m an artist but also a stay-at-home mother, so decorating my house is my creative outlet,” she says. On those walls, she’s hung a combination of Maldonado’s work and her own flora- and fauna-inspired fabric wall panels. 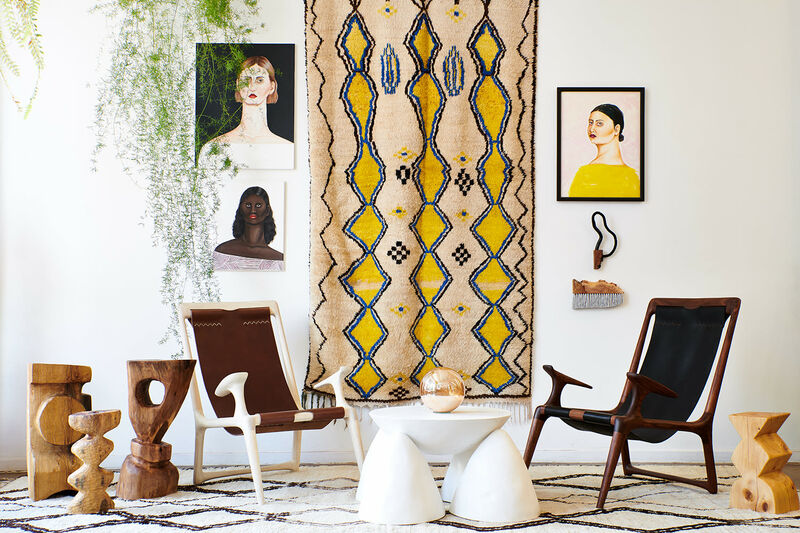 And these pieces provide a backdrop for their modern Danish furniture, designer ceramics, and garage-sale knickknacks.